Propaids Builders and Developers Pvt Ltd (Propaids)is a private limited company incorporated in Chennai for the purpose of developing Apartments & Villas in South India, with special concentration for areas in and around Chennai. The Promoters of Propaids have specialized in the field of Innovative construction techniques and have expertise in in a variety of fields like Design, engineering, construction, finance, marketing and entrepreneurship. They have successfully completed several construction projects in Chennai, Bangalore and Mysore, and we continue to be associated with several projects in these areas. 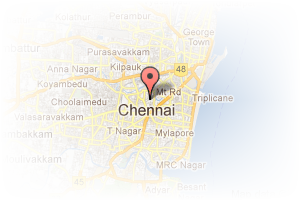 Address: D2, First Floor, Anmol Palani, 88 G.N. Chetty Road, Theyagaraya Nagar, Chennai, Tamil Nadu, India. This Builder Profile page for "Propaids Builders & Developers Pvt" has been created by PropertyWala.com. 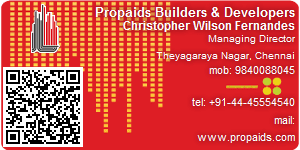 "Propaids Builders & Developers Pvt" is not endorsed by or affiliated with PropertyWala.com. For questions regarding Builder Profiles on PropertyWala.com please contact us.